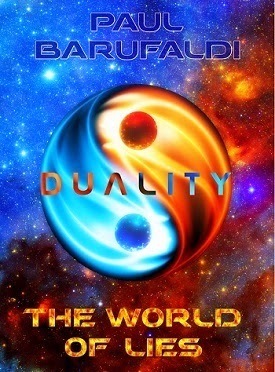 Today we are interviewing Paul Barufaldi, author of the science fiction novel DUALITY: The World of Lies. I spent the past 13 years living abroad in Beijing, China. I lived in the old city and taught English for living. It’s a tale itself, but one probably too sordid for the telling. Now that I’m repatriated, I figured I would try my hand at the craft of writing. I’ve had these ideas kicking around in my head for so many years and they were long overdue to put into print. That’s the focus of my life: getting WOL published and conquering another manuscript. It’s addictive, and I like it, so I’m determined to keep this momentum going. The World of Lies follows two stories from several different characters perspectives. First we have the star-crossed duo of Aru Psyron and Li Meiyang of The Kinetic Dream trespassing into the fiery depths of the Red Star itself and the realm of ascended master and Emperor, Lord Logos. Then we follow the tale of young Gahre of the sequestered lands of the Pangea on the Blue homeworld of Occitania. Disgusted by the repression of knowledge at the hand of the government, he sets out to uncover the truth by sheer force of will under his own two feet. All of these stories are overshadowed by the Ascended Masters of the Blue and Red Stars and who straddle the line the between existence and non-existence in a silent game of chess the beings of the Taiji are only left to guess at. I imagine hard-science readers and out-of-the-box cosmologists would enjoy this work, but I tried to write it on a level that will also appeal to a more general audience. What inspired you to write a sci-fi novel with dual story arcs? I think it’s an interesting device that makes for a more diverse reading experience. I also experimented with changing character perspectives with each chapter. I know that’s against all the perspective advice for new authors, but I think I’ve made it work, and it’s a lot of fun to get into different character’s heads and see their often drastically differing take on events. Was it challenging to write two stories that are separate yet complementary? No, it’s actually a lot easier! In the manuscript writing phase I found that going back and forth kept my writing fresh. It prevented me from burning out and writing stale material, which is a common pitfall when composing a single drawn-out continuous story. One of your story arcs involves a monk on a journey through exotic lands. Without giving too much away, can you tell us a bit about what he encounters during this journey? He traverses between natural wonders like one move through a dream, and meets some very colorful characters along the way. I’d have to say it’s Li Meiyang. She is very outspoken…. Or maybe “mouthy” would be the better term. She’s equal parts insightful and sarcastic, domineering and demure, clever -and at times profane. Writing chapters from her perspective was definitely the most fun. I’m already at work on the sequel: DUALITY: Soul Splitter -which picks up right where WOL leaves off. Readers can expect to see a lot more development in the series primary story arc as Gahre and his counterpart (?) fully come into their own. There’s going to be a lot more action in this novel, including an epic rampage across space, and of course there will be a lot more mystery and intrigue, particularly as the crew of the Kinetic take on an ancient machine lord. The source of evil in the Taiji becomes more apparent and an Ascended Master will be revealed. Yes, they can get it free. I’ll be doing a Kindle free giveaway soon. Just stay tuned to my blog or Amazon author’s page. I’m keeping the price low and just trying to get it out there, since it’s my first novel and thus have no following of readers. So far I’ve gotten a lot of positive feedback, and I really hope this book offers something unique to each and every reader. The compass led him to the ridge of a grand caldera. He could see the full span of it that covered hundreds of kilometers, coated in lush greenery, plains and herds of grazing animals. In no time he was among them. At its center he came upon a crystal lake teaming with fish so enormous, the meat of one alone fed him for days. The predators did attempt to stalk him, wolf and leopard, but perhaps he was just a curiosity for these creatures that had never before seen man. He called out in warning when he sensed them, and hearing his voice they dispersed and went on their way and he on his. Gahre already had the peculiar habit of talking to animals, and he found himself putting to daily use. What's more he seemed to understand their answers, in squawks or squeaks, growls or snorts. He understood them clearly, because he was himself close to nature and understood them in the context of their natural habitat and as caring about the things animals cared about, like food and safety. The caldera rose to its rim and he saw the first bare rocky ground of the badlands emerge under his feet soonafter. It was a barren range but easy ground to cover. The landscape had a painted feel, and the clear nights painted in cosmic clouds above it imparted in him a deep spiritual appreciation for this world of sparse grass prairies and jutting rocky spires that grew into mountains as he wore on. Firewood was in short supply and nights were cold. He could barely stomach the dry salted duck at times and he craved green vegetables, but what those rations failed to provide in satisfying his palette they made up for by providing the raw energy it took to traverse this rugged ground. Where the sands turned red, he imagined this was what the terrain of the bloodmoon Oberion looked like, a pale dusty dead world.